Rebuild the structure of your skin from within. Next-generation dissolvable threads have been available in Australia since 2009, and have been successfully used in hundreds of thread lift procedures. The threads dissolve within 9 to 12 months, while the long term benefits of the thread lift will last for several years. The threads are patented, unique, absorbable and offer significant advantages compared to the older style threads. These new revitalizing threads are very different to the older threads that were used in the past. The new threads (unlike the conventional smooth threads) have small soft barbs (also known as cogs) that resemble a fishbone. When inserted just under the skin the cogs cling to the facial soft tissue, gently lifting the tissue and thereby providing a new support scaffolding that lifts and holds the tissue in place. These new threads rebuild the structure of your skin from within. Over a period of nine to twelve months the threads dissolve – but before dissolving they produce fibrosis that in turn creates a new support scaffolding of collagen for the skin. This new scaffolding can lift and support the thread lift for many years to come. In addition to the lift effect, the thread lift creates new skin firmness and may assist with improved skin colour, skin tone and texture. 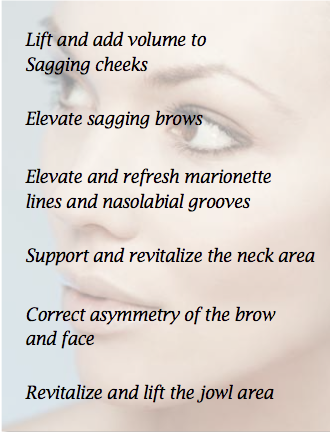 The thread lift preserves the natural contours of the face, so that the results are more subtle and natural looking. 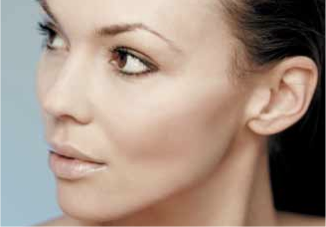 The results are achieved without hospitalisation, without scarring and with a minimum of downtime. In fact, you can return home within a few hours and resume normal activities after a few days. The advantage of absorbable threads is that they will not impact on any future procedures (should you wish further thread lifts or other lifts in years to come). From even an early age the ageing process becomes visible. Connective tissue thins and collagen and elastin fibers start to break down. The result is sagging of the tissues, with folds and wrinkles appearing. It is at this point, or even earlier, that many women and men seek to refresh and rejuvenate a tired look. Your doctor may recommend a revitalizing thread lift as a procedure to rejuvenate your face, restoring the youthful contours without changing the natural features of your face and neck. In addition to restoring the natural facial contours there are also other advantages of a thread lift procedure, including new skin firmness, and the procedure may improve skin colour, tone and texture. The thread lift is a minimally invasive procedure that can be carried out in the doctor’s medical suite with a minimum of downtime and at a cost much less than a conventional facelift. Unlike traditional face-lifting procedures, the Promoitalia dissolvable threads offer a “soft” surgical approach and in typical cases do not leave any scars on the skin. The typical thread lift takes from 45 to 90 minutes depending on the number of threads, after which you can return home within a few hours.